They don’t call Queensland the Sunshine State for nothing. 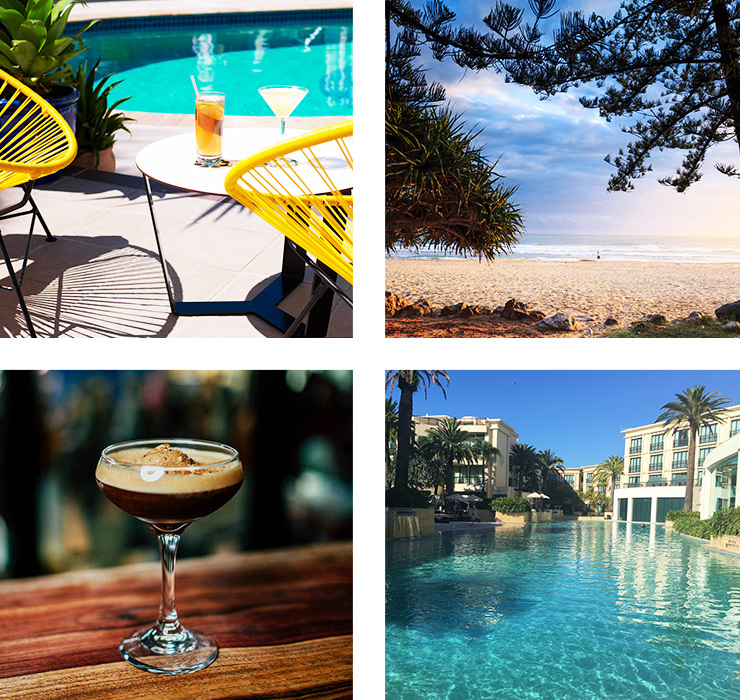 It’s the kind of place you’ll happily save up your hard earned annual leave for, because come January there’s no place we’d rather be than on the GC. Balmy nights, hot sand and luxury living is what this golden paradise is all about, and you can start the new year in style at the Jeep Magic Millions Carnival, from 6th to 17th of January. Spend a week with the elite at the Pacific Fair Magic Millions Polo, go trackside at Australia’s $10 million Jeep Magic Millions Raceday and live like a royal while you eat and drink your way through the best of the glorious Gold Coast. We’ve done the hard work and sorted your itinerary (we’re even giving away VIP tickets to the polo, 2 x night accomodation at the QT Gold Coast, 1x $250 shopping voucher + 1 x 1-hour personal styling session - see below), so start packing your bags people! Deck yourself out with the coolest shoes and accessories in town (think Yeezy, Alexander Wang and Isabel Marant) at Incu. Offering a curated collection of local and international designs for men and women, this boutique is the perfect place to shop for the finer details, like a pocket square or that on trend boater hat. 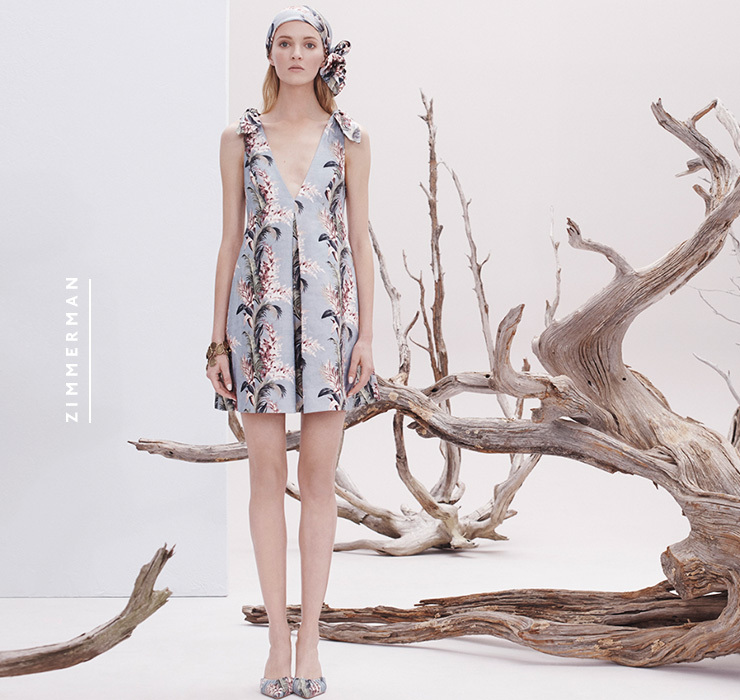 Zimmermann offers some of the best retail therapy going around, so get lost in the whimsical world of these dreamy designs and earn yourself some serious it-girl cred. This Aussie fashion empire does holiday resort wear like no other and you’ll find just the right amount of frills and florals for a day at the races— or night on the town. We all know shopping is a form of cardio, so take a break from all that hard work and treat yourself to a beauty update with the make up goddesses at Mecca. Redeemable for any product you goddamn want, get a long lasting and dewy, natural summer look and add a pop of colour to your lips. Whether you’re after dinner, drinks, or both, Bin 232 is the place to put at the top of your GC must-do list. 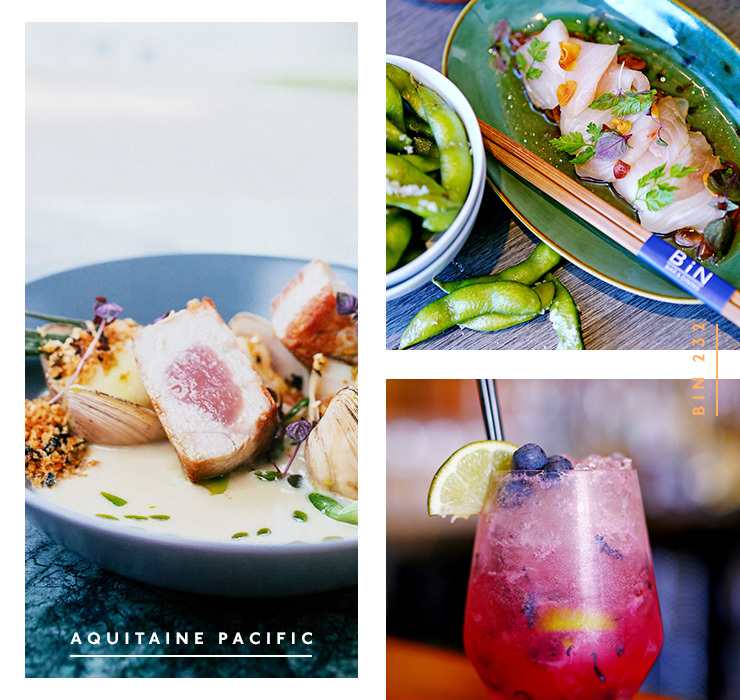 Cocktails, tapas and delicious Asian inspired eats (think miso-glazed barramundi and duck spring rolls) is what this place is known for, so get there early and stay all night. There’s never a better time to pop a bottle of champagne and feast on freshly shucked oysters than when you’re at the beach, and luckily for you, champagne and oysters are Aquitaine Pacific’s speciality. This French inspired coastal restaurant dishes up delicious ocean delicacies (aka oysters) with gin and cucumber dressing and/or champagne and dill foam, so go on, order a dozen (or two) and another bottle of bubbles. After a long day of tanning, you deserve some Latino lovin’ and Comuna Cantina is about as close to Mexico as you can get (without leaving the country). Devour fresh, authentic, tasty street morsels like grilled sweet corn and pincho bbq skewers, then rehydrate with frozen margaritas served out of watermelons. We know, the Instagrams. You might be on vacay but that doesn’t mean you won’t need your daily dose of caffeine. Brought to you by the guys behind Brisbane’s Moose & Gibson and Habitat (among others), Two Seasons brews some of the best beans in town, so head here for a cup of liquid gold and start your day with this strong and smooth blend. 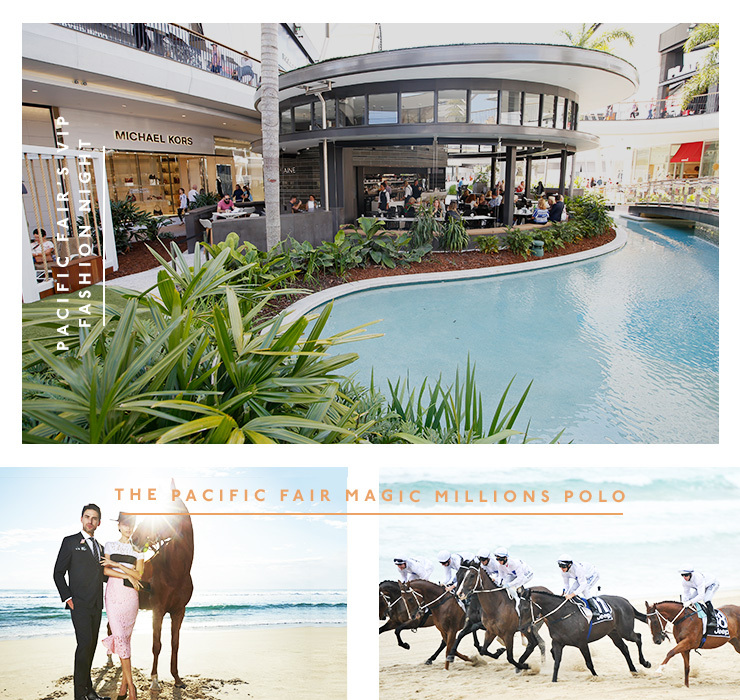 Set to be the event of the summer, The Pacific Fair Magic Millions Polo (on January 8th) is where sport meets style. Dressed in their best, the fash-pack, sporting champs and a-listers alike will come together for what’s basically going to be one big garden party. Give yourself the royal treatment and revel in what was once known as the sport of kings. Step up your style game at Pacific Fair’s VIP Fashion Night on Janurary 11th. Global luxury brands and high street designers join forces by the poolside (yes, there’s a pool) to bring you a night of fashion, food and entertainment. Did we mention there’s Prada? Make the most of the sun, the sea and the sand at the Magic Millions Barrier Draw (on January 10th). From 6am (hello sunrise), champion jockeys and their horses will gallop down the iconic Surfer Paradise foreshore and frolic in the waves. Forget the Melbourne Cup and party like a millionaire at one of Australia’s richest races, the Jeep Magic Millions Gold Coast Race Day (14th January). Being in Queensland you’re pretty much guaranteed sunshine, and you can expect all the usual glitz and glamour that makes the GC so great. Frock up, or suit up if that’s more your jam, and don’t miss a minute of the action. California cool meets 70s glamour at the QT Hotel in Surfers Paradise. 50 metres from the beach, you’ll spot it by the vintage Holden out front, and once you’re inside you won't want to leave. Boasting a luxury spa, chic lounge pool and iPad concierge, you’re guaranteed to get some serious (holiday) beauty sleep. Afternoon nap by the pool anyone? One of the most iconic hotels on the east coast, Palazzo Versace screams luxury. Do as Beyonce and Jay Z do and live the Versace lifestyle for at least one week– more is more, right? Editor's note: This article is proudly sponsored by Magic Millions and Gold Coast Tourism and endorsed by The Urban List. Thank you for supporting the sponsors who make The Urban List possible. Click here for more information on our editorial policy.